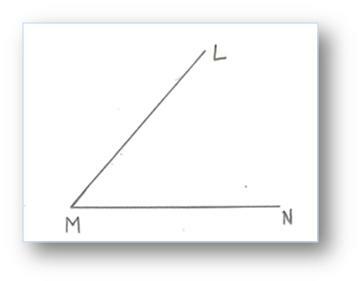 Bisecting an angle means dividing it into two equal angles. 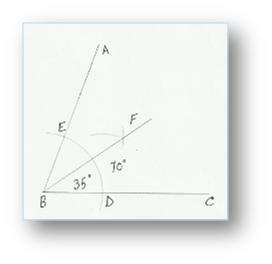 The ray which bisects an angle is known as its bisector. ∠LMN is the given angles. Fold the paper so that LM falls along MN and press the paper in this position so as to get an impression. Unfold the paper. Draw the line along the impression. ∠XYZ is to be bisected. Measure∠ XYZ with the help of protractor. Let it be 72°. We know half of 72° is 36°. Make ∠XYW = 36°, so that YW falls within ∠XYZ. 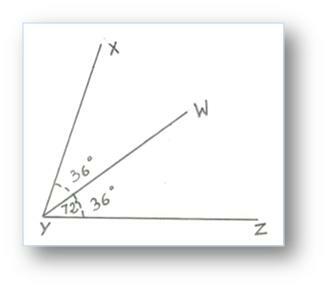 Now ∠XYZ is divided into two equal angles by the line YW. ∠ABC is to be bisected. Place the metal end of the compass at B and draw an arc to cut BC at D and AB at E.
Place the metal end at E and D with any convenient radius, draw two arcs (same radius) cutting each other at F.
FB is the bisector of ∠ABC.